Pink should be pretty. Except for the hilarious cat, Pinkie, and some of the pink and pinked-up clothes, I wasn’t a huge fan of the illustrative style. And, oh, I like pink, but a couple pages practically made my eyes hurt; luckily, just a couple.The story is very sweet though, although I have mixed feelings about the gender issues. I do love how mama can’t go to the pink picnic because of her pink spots illness and I do like how daddy steps up, and how daddy has fun too, and how all the females at the picnic welcome him with open arms and think he looks wonderful in pink. I like the humor in the book also. Very cute!Fancy Nancy fans are a good readership for this book.This is a fine book for early independent readers and reading aloud to one child or a group of children. If you know fans of Fancy Nancy, Pinkalicious, etc. etc. they must have this book. When young bunny's mom gets sick and can't take her to the pink-nic, she decides "today is the worst day ever." This is a two-page spread you have to see, absolutely hilarious. When papa bunny offers to take her to her party the young, distraught girl tells him something very important "daddy, you're a boy!" As luck and ingenuity would have it, daddy gets pinked up and they have a wonderful time. Pretty cute story about a little girl bunny who seriously loves pink. She's looking forward to a special "pink-nic" day with her mom. But because her mom is sick, her dad substitutes. Can dads wear pink? Uh, heck yeah they can! Violet wakes up and declares that it’s going to be the best day ever, as she and her mother are attending the "Pink Girls Pink-nic" today. But when she wakes her mom and she’s covered in pink spots, it turns out this is the worst day ever, because her mom is sick and they’re going to miss the pink-nic. Then her dad offers to take her, but she reminds him that he’s a boy, and “Boys are NOT pink.” Her dad doesn’t give up, though. He tells her to “Pink me up,” and with lots of creativity, she does indeed make her dad pink enough to attend the Pink Girls Pink-nic with her. 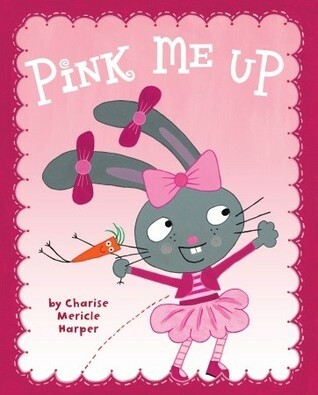 I have to say that I love Pink Me Up by Charise Mericle Harper, and so does my daughter, who is four and would love to go to a pink-nic with her daddy. There are a few things in this book that I especially like. First is the message that if something happens to ruin your plans, you shouldn’t just cry about it ~ do something to make it work. Second is the strong father figure in the story. He’s willing to cover himself in pink and head to a pink-nic with his little girl and a bunch of moms and their daughters. It would take a strong man to do that! Finally, I love the illustrations, which add even more fun to the story.Harper has created a picture book that will appeal to young girls who love pink, and even those who don’t. It’s an adorable story of a father and daughter. I’m sure all the daddies out there will have a blast reading it to their little girls! Three stars, most of which are because I adore pink.In a nutshell, this story really makes no sense. A kid bunny, who happens to be playing with a walking carrot, decides to go to an all-girl pink event. In a tragic turn of events, mom bunny comes down with something resembling chicken pox. Mom bunny smears green toothpaste on her face and informs kid bunny that sadly, she must find someone else.So kid bunny explores her options until daddy bunny declares that he is secure in his manhood and would certainly love to go to a pink event. So kid bunny puts pink duct tape and pink paper and other useless items all over daddy, and daddy declares that boys can be pink too. How politically correct.In the end, other kid bunnies make their daddies look flamboyant and we all learn a lesson on the flexibility of gender roles. Or, something like that.I like pink, but the rest of this really just was random weirdness. I like that it's the mom's idea for the dad to take the girl to the picnic (because obviously, when one parent is sick the other parent is gonna fill it) and that the dad is totally like, "Boys can be pink" and has a pink tie and is amenable to the kid pinking him up even further (because obvs, if your kid wants you to play dress up, you play along).I like that no one fusses about Daddy going to the "Pink Girls Pink-nic" -- that it's just about lots of pink and the other moms are totally affirming and the other kids now wanna pink up their dads.Lots of girls are really into pink etc., and I appreciate that this book totally rolls with that -- gently teaching that pink doesn't have to be just for girls but not femme-shaming at all. As a father of two daughters, I appreciated a book that shows the lengths a daddy will go to for his little girl. Sometimes we have to sit in on tea parties, help dress up dolls, and rescue the princess. One thing I didn't like: After learning her mommy was sick, the little bunny threw herself on the floor and declared it the worst day ever. It struck me as a little over-dramatic. Things do not always go as planned, and when they don't, I hope my daughters learn to handle it better than this bunny. Funny! Violet is beyond excited about going to the Pink Girls Pink-nic, but Mom is sick and can't go. So Dad offers to go, but the only pink thing he owns is a tie. Sooo, Violet "pinks him up." Very cute. (I especially like Violet's orange toy carrot and her orange cat, who does NOT want to be pinked up.) Good for a storytime w/ a pink theme, or a clothing theme, and you could pink up your own clothes as you told the story (by taping pink paper circles on your shirt, putting strips of pink tape down your pants legs, putting pink shower caps over your shoes, etc.). Violet Bunny is ecstatic about going to the pink-nic and tea party with her mom. Unfortunately, her mom gets sick, so dad is going to go instead. Violet looks at him very seriously and says "Dad, I have to tell you something. You are a boy." He takes it all in stride and lets Violet "pink up" all his clothes for the pink-nic. All the other girls are so jealous and wish they could pink up their dads. Super sweet and fun illustrations. Very cute, very pink story that shows how Dads can save the day. Our girls just loved it and we took turns reading each page - it was a real boost for our five year old to be able to read some of the sentences on her own. We enjoyed reading this book together and we've read this a couple of times. Does a much better job than most at dispelling the notion that pink is not just for girls, that boys (like daddys) can wear and even like wearing pink. I liked the illustrations and the steps they took to make daddy pink enough to go to the Pink-nic. This was read at the preschooler story time today. The story's message is that dads can fill in mom roles, even wearing pink at the "pinknic." It was fun how they pinked up the dad, and touching that he was completely willing to do so. A great book for girly girls and their fathers. A girl is supposed to go to a pin-themed picnic with her mom but her mom can't go because she gets sick. Her dad decides to go instead. they draw pink polka dots and put pink stickers on his clothes and have a great tme at the picnic. A little girl is going to "pink" party and her mom can't come, so she has to take her dad and get him pinked up for the party. Really cute! It was fun for my husband to read this to my little girl who loves pink. Cute little story. The mom is sick so she can't make the "pink" party. Luckily the sweet daddy fills in (although the little girl doubts his ability to get all pinked up). Yay for dads who go to great lengths for their kids! My daughter loves it when I read her this story and I have to agree. It is a very enjoyable read. Read this with my girls and it was so cute. They laughed and really enjoyed it. A sweet story of Dad coming to the rescue after Mom gets sick and about creatively our little bunny gets him ready for the pink-nic. So cute for a pink storytime or a father/daughter storytime! Very cute. My daughter loved it too. CuteThis was a cute book to read to my baby girl. Love the suggestions at the end of the book for picking up dad. Corinne who loves pink is sure to like this story. The challenge to gender normativity presented here is weak and dissatisfying. Our young readers deserve better than this junk. Charise Mericle Harper is better with illustration than story. Cute book, if a little garish. I hope no real youngsters ruin their parents' clothing with paint and stickers as a result of this story! More like 3.5 stars. My daughter liked it simply because she likes pink. Terrible writing but cute concept. Maybe this is about breaking stereotypes but it didn't work for me. When Momma gets pink spots and is too sick to go to the Pink-nic, Daddy has to step in . . . after Violet pinks him up.